Singing string plugin, or just strung out? Another great instrument from Embertone designed with great care and attention to detail. Excellent scripting makes for a very playable instrument. Solo and Ensemble modes. iPad control. Hard to find fault here. Embertone, purveyors of Kontakt-based instruments, got us to re-think the role of traditional instruments in a dance music context with the arrival of its stupendous Sensual Saxophone. What set this apart from many other libraries was the immediate playability of the instrument - a simple movement of the mod wheel pushing the tone into rasps of reverberant joy. So to the Friedlander Violin, a detailed solo violin library containing more than 3500 samples. Of course, it isn't just about how many samples a library has, it is a question of how they are managed during playback, and how easy it is to coax a performance out of them. "In essence, you get fully realised legato and portamento with round robin triggering and alternate bowing and re-bowing"
Weighing-in at over 3.5GB when installed, the library provides both 16 and 24-bit flavours as well as a whole set of different patches that aim to ease the load on CPU cycles and RAM usage. In essence though, you get fully realised legato and portamento with round robin triggering and alternate bowing and re-bowing. Polyphonic sustained and staccato styles are also included, controlled by MIDI key-switching or directly from the interface. Samples were recoded without vibrato, allowing Embertone to add their own controllable custom modulations based on five core 'style presets'. In the Configuration section further functions cover aspects such as Bow Noise. iPad users have an added bonus in the form of a ready-rolled template for Touch OSC (£2.99 in the iTunes Store), a well-regarded programmable control surface app. 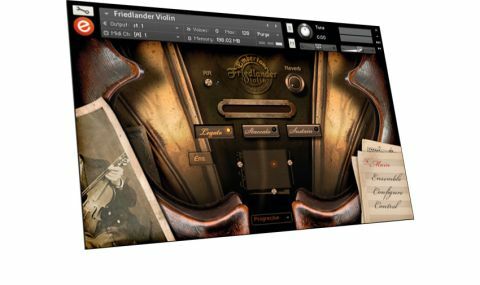 By installing Touch OSC Bridge software on our main production computer we could engage multi-touch gestures with one hand, whilst playing notes with the other. Very neat. "It's possible to get quick and high-quality results with little more than a few key presses and the Modulation Wheel"
In use, we found the Friedlander Violin a real pleasure to play. We're no violin players, but it felt very easy to generate a convincing performance from this library, and the attention to detail in vibrato programming alone is exceptional. So whilst you can utilise all manner of MIDI controllers to aid the performance, and even utilise an iPad to make it more manageable, it is still possible to get quick and high-quality results with little more than a few key presses and the Modulation Wheel. Being able to switch to Ensemble mode, whilst maintaining control over intonation, timing and the number of instruments adds value and broadens the scope of this library. It also takes advantage of the Kontakt-generated vibrato on a per instrument basis that makes it all the more convincing. We'd happily recommend Friedlander Violin to any Kontakt-equipped musician looking for an instrument that works well in a wide range of styles.